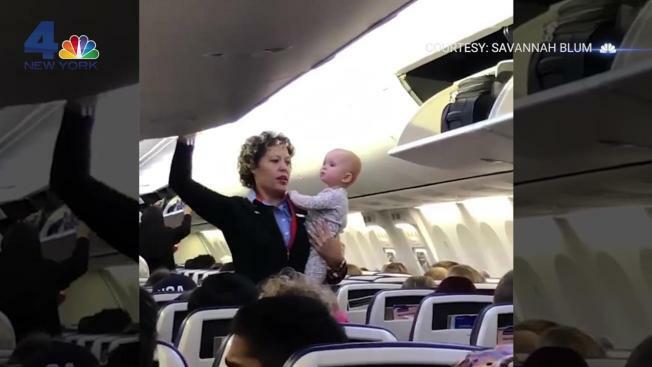 A Southwest flight attendant trekked through her pre-takeoff routine holding a restless baby girl -- an effort to help soothe the child that ended in many blown kisses and a plane full of smiles, adorable video shows. Savannah Blum, a teacher, says she and her 19-month-old daughter Brittan went to visit family in Texas during her school's spring break. They were heading back to their home in Reno on Saturday -- and Brittan, who normally sleeps on the plane, wasn't interested in a 2.5-hour snooze on the trip home from Austin. They had to stop in Las Vegas first and weren't supposed to have to change planes, but they ended up having to swap, Blum said. Fortunately for her, the flight attendant, whom Blum identified as Jessica, said, "I'm gonna be on the flight with you." They boarded the second flight, the one to take them home, and Blum says Jessica reached out for Brittain and said, "Come here, baby. I got her, Mama. You go sit down." Blum, who could still see her daughter from her seat, started recording. Her video shows the flight attendant carrying Brittan as she walks down the aisle preparing the plane for takeoff, closing overhead bins and reminding people to set their phones to airplane mode. The baby starts blowing kisses as they make their way toward the front of the plane, showering travelers with virtual smooches as audible "Awws" are heard from people in their seats. The video has been watched more than 1,400 times since it was posted to Facebook Monday with the message: "Everyone loves this little girl- even Southwest passengers and flight attendants ☺️✈️�� #southwestairlines." Southwest Airlines said its employees "take great pride in delivering our legendary Southwest Hospitality, so it's not surprising that one of our amazing Flight Attendants shared her Southwest Heart while helping to care for one of our youngest customers in such a sweet, fun way!"